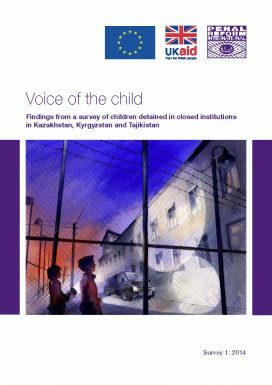 This report contains the findings of a survey of 274 children held in closed institutions (policy custody, detention centres and social care institutions) in three Central Asian countries: Kazakhstan, Kyrgyzstan and Tajikistan. The survey was carried out by PRI, with the support of the Ombudsman’s office in Kazakhstan, together with local partner organisations in the autumn of 2014. Children interviewed were asked, for example, about their experience of ill-treatment and abuse in each institution, the length of time spent in policy custody, whether or not they had received legal assistance, contact they had with parents and family, disciplinary measures used, recourse to complaints, their views on the conditions in the facility they were held, and what they would change. staff feel underpaid and badly supported to deal with the children in their care. This report is the first of three ‘Voice of the Child’ reports from Central Asia and seeks to highlight priority areas for reform for policy-makers, practitioners and other stakeholders. It was produced under a three-year project funded by the European Union for the progressive abolition of violence against children in these countries.